Echo is Amazon's talking device that allows you do all kinds of interesting things such as play music from Amazon and other music sources. Echo has a program called "Alexa" that can understand many voice commands. To make Alexa do something, just say "Alexa" and then tell Alexa what you want it to do. Because it answers to Alexa", that's what many people call the device, but the product name is actually "Echo". With the free Alexa app, you can set up your device, manage your alarms, music, shopping lists, and more. The Alexa app is available on computers, phones and tablets. 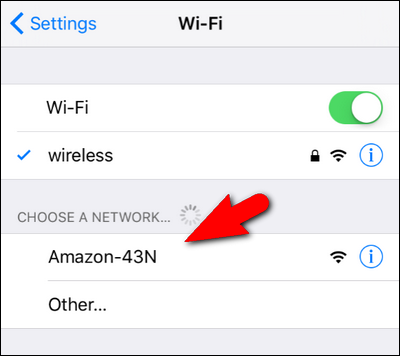 You can also go to https://alexa.amazon.com from Safari, Chrome, Firefox, Microsoft Edge, or Internet Explorer (10 or higher) on your Wi-Fi enabled computer. Plug the included power adapter into Echo and then into a power outlet. The light ring on Echo turns blue, and then orange. When the light turns orange, Echo greets you. In order to talk to an unconfigured Echo device you treat it as a WiFi network hotspot and connect to it. Note that if it isn't on the internet then you won't be able to talk to the internet either. 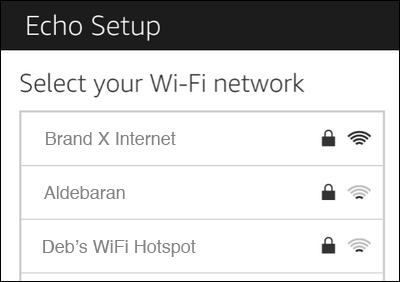 So go to your list of WiFi networks, and select the one for your Echo device. It might have Amazon in the name and if you are standing next to it, it should be a strong signal. OK, you are now connected to Echo. Next, we want to connect it to the WiFi using the App. Echo doesn't have a keyboard, so you have to use the App to connect Echo to a Wi-Fi network. Dno't start the App until you have connected to the Echo's WiFi signal as explained in the previous step. Our next goal is to connect Alexa to the Internet. Basically you need to tell Alexa the name of your WiFi network and the password. If we set up your router for you, then the network name (SSID) is probably "Brand X Internet" and the password is probably "11111111". If you have used this device before and are reconfiguring, select your device and then select Update Wi-Fi. If this is a new device, select "Set up a new device" instead. On your Echo device, press and hold the Action button until the light ring changes to orange.Your mobile device will then connect to your Echo device. A list of available Wi-Fi networks appear in the app. Note: The Alexa app may ask you to manually connect your device to your Echo device through your Wi-Fi settings. Select your Wi-Fi network and enter the network password. If you don't see your Wi-Fi network, scroll down and select Rescan. Tip: If your Echo doesn't connect to your Wi-Fi network, unplug and then plug the device into a power outlet to restart it. If you still have trouble, reset your Echo to its factory settings and set it up again. You can now use your Echo device. To get started, say the "wake word" and then speak naturally to Alexa. Your Echo device is set to respond to the wake word "Alexa" by default, but you can use the Alexa app to change the wake word at any time. In the app, go to Settings, select your Echo device, and then select Wake word.